With Galentine’s Day just days away, we thought we’d take the opportunity to talk a little about why we think it’s so important to create and celebrate your own feminist holidays. Of course this character, who kept a “Wall of Inspirational Women” in her office, created her own feminist holiday, to celebrate the real-life women heroes in her life. What is so feminist about Galentine’s Day? How is simply celebrating your female friends a feminist act? Women are too often portrayed as competitive and catty, pitted against one another as if we are all competing for limited resources. Feminism is “a movement to end sexism, sexist exploitation and oppression” (bell hooks). One of the ways women and womxn-identifying folks are exploited is by creating a narrative that tries to pit us one against the other. You know who else advocates for creating your own holidays? 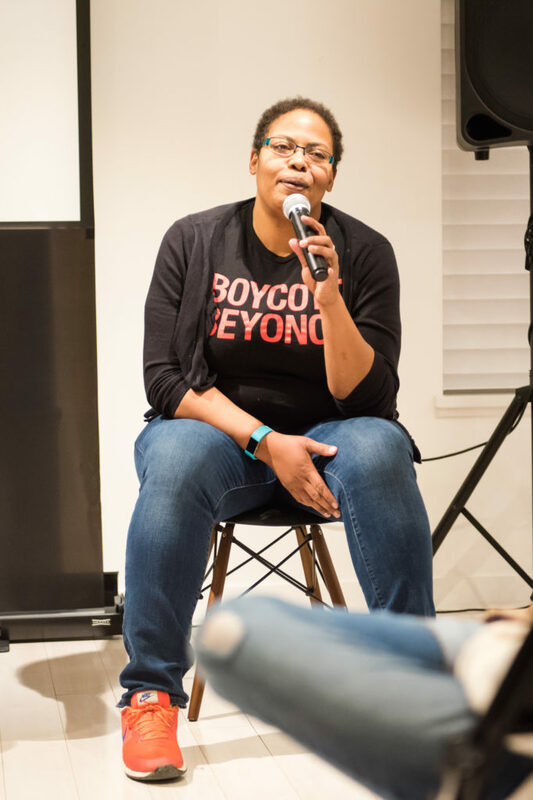 Dr. Courtney Marshall, one of our panelists for Feminist Theory + Lemonade. During our post-film discussion, Dr. Marshall talked about creating “The Audre Lorde Awards” for her friends (and printing fancy-looking certificates to go with them) and creating events around birthdays and milestones of her feminist heroes. Her final takeaway at the end of the evening was: Create and celebrate your own feminist holidays. In a white supremacist, capitalist patriarchal culture, we are bombarded with holidays that are centered around dubious white men and questionable historic interpretations, and encouraged to celebrate them by building wealth for those who already have economic power. Therefore, creating your own feminist holidays, and celebrating them by supporting other local feminist businesses, artists and individuals, is an act of feminism. Not only is it rewarding to celebrate the people and things that inspire you, throwing a feminist holiday celebration is one more way to bring together your feminist friends. And bringing together even a small group of values-aligned individuals often results in unexpected connections, new ideas and motivation for activism. We’re excited for Galentine’s Day — not only is a great excuse to gather together with your fave feminist pals, we’re also going to be celebrating the history and cultural value of chocolate (because our host is a small batch chocolate maker! ), reading feminist poetry and sharing our favorite examples of female friendship from literature and pop culture. Hope to see you there — or at the next feminist holiday you create. Do it.